A large, camouflaged twin-engined bomber lay at a crazy angle across the runway, smoke and dust rising from where it had come to rest. Japanese blood-red roundels were displayed prominently on its wings and fuselage. Muffled sounds of shouting and violent movement emanated from inside the aircraft that had landed wheels-up with a screeching of metal a few moments before. Suddenly, the aircraft’s Perspex nose cone was kicked away and out crawled several Japanese soldiers dressed in beige uniforms that had been blackened with soot and soft forage caps, their web equipment festooned with weapons. 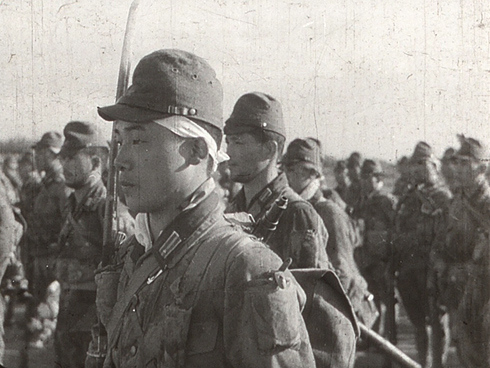 Beneath their caps most wore white hachimachi headbands just like their Kamikaze brothers in the Army Air Service that were emblazoned with Japanese characters or the red rising run. More soldiers’ flung open the fuselage doors and tumbled out onto the tarmac. Quickly sorting themselves out, they ran off in small groups screaming, shouting and firing their rifles and machine guns in all directions, while others ran along carrying long poles and lengths of rope, their faces blackened with camouflage cream. American tracer rounds whipped across the airfield, and the dull boom of anti-aircraft guns provided a cacophony of noise as the Japanese soldiers raced determinedly through the darkness and set about their destructive tasks. The unrelenting B-29 bomber offensive against the Japanese Home Islands in 1944-45 led the Japanese to attempt to deny the Americans the use of their new airfields in the Mariana Islands. The Japanese Military Police (Kempeitai) had a special services department that dreamt up commando operations to rival some of the great raids launched by the British and Americans during the war. The Kempeitai was a huge organization that administered a myriad of very different departments. One of its areas of speciality was the launching of commando-style reconnaissance and sabotage missions using units drawn from the regular army with attached Kempeitai specialists. Three such organizations were created in the latter part of the war. Matsu Kikan (Pine Tree) undertook secret reconnaissance missions to Australia; Minami Kikan (Little Tree) was a secret unit attached to the puppet Burmese National Army; and the Giretsu Airborne Unit was a specialist kamikaze raiding force assembled to neutralize American B-29 bomber bases. All three came under the command of Japanese Army Intelligence, the Japanese Army Espionage Service and the Kempeitai Intelligence Unit. By late 1944 B-29s were flying in force against targets in mainland Japan, and Japanese air defences were inadequate to stop them burning down cities virtually at will. Desperate times called for desperate measures. The B-29s flew from a handful of large airbases on Okinawa, Saipan, Tinian, Guam and the Ryukyu Islands. The Kempeitai, working closely with army intelligence, decided that the best way to neutralize the B-29 threat was not by trying to knock them out of the skies over Japan, but by destroying the aircraft at source – that is, on their newly captured airfields. The Japanese had already tried launching conventional bombing missions against these airfields, but the results had been negligible as American fighter cover and anti-aircraft defences were extremely strong and Japanese losses in men and planes made the missions pointless. The Kamikaze operations around Okinawa had, however, borne some fruit for the Japanese, and it was becoming clear to higher command that the only way to strike the Americans hard was to send young, determined, and brave men on one-way missions. They would sell their lives dearly for their Emperor and nation without harbouring thoughts of survival, making such men formidable and determined adversaries. The Japanese plan called for a new kind of Kamikaze unit – a commando force able to land by sea or by air to physically destroy the parked B-29s on the airfields and cause as much damage and confusion as possible before they were killed in action. The Japanese Army already had a division-sized force of paratroopers that had been raised in 1941 and formed part of the Army Air Service. The Imperial Navy also maintained Marine Parachute Units. The army paratroops were divided into raiding brigades and regiments, and they had first seen action in 1942 when they had dropped on the oil fields at Palembang in Sumatra during the Japanese invasion of the Netherlands East Indies. 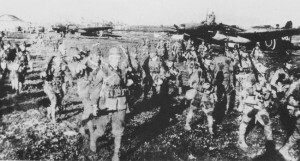 The 1st Raiding Regiment under Colonel Seiichi Kume and elements of the 2nd Raiding Regiment under Major Niihara had quickly overwhelmed the enemy and achieved all of their objectives. The idea of taking out American airfields using special raiding forces had also already been attempted by the Japanese. On 6 December 1944 a 750-strong detachment from the 2nd Raiding Brigade had dropped on American airfields in the Burauen area of Leyte in the Philippines. They had managed to destroy some aircraft and inflicted casualties on the Americans, but ultimately the entire Japanese force had been wiped out. Now, in late 1944, the Japanese searched around for a man to lead a new Kempeitai-controlled commando unit and discovered the bespectacled Captain Michiro Okuyama, the commanding officer of the 1st Raiding Regiment’s Engineer Company. He and his men were highly trained in sabotage and demolition, and Okuyama had been the first member of the original army parachute training unit. He was known as an outstanding officer and leader of men and he was highly respected by his superiors. Headquarters ordered Okuyama to select 126 men to form the new Giretsu (Respect for Faith) Airborne Unit, making it clear that the mission they would be training for was a suicide assault from which none were expected to return from alive. Okuyama selected his men, most of whom were fellow combat engineers and sabotage experts from his own regiment. Okuyama would lead the Command Section, while the assaulting groups were divided into five platoons. 1st Platoon was led by Lieutenant Utsuki, 2nd by Lieutenant Sugata, 3rd by Captain Watabe, 4th by Lieutenant Murakami and lastly, 5th Platoon was under the command of Lieutenant Yamada, all experienced and respected officers. On 5 December 1944, Giretsu Airborne Unit was assembled at the Army’s Air Academy at Saitama. Okuyama’s unit was joined by ten Kempeitai intelligence officers from the Nakano Intelligence School, two officers being assigned to each assault platoon, bringing the unit’s strength up to 136 men. At the academy a mock-up B-29 was constructed and two new explosive devices quickly developed to deal with the American aircraft. The first was a 2kg explosive charge on the end of a pole. On top of the charge was a rubber suction cup. The saboteur pushed the pole under the B-29s wing; the explosive charge stuck to the aircraft skin, and then a cord was pulled to ignite a delay fuse. The second new weapon was a chain charge. It consisted of a rope measuring 13-16 feet in length that was fitted with explosive charges along its length. A small sandbag weighted one end. The weapon could thus be thrown over a B-29s wings or fuselage and ignited to cause maximum damage to the aircraft. The training was intense. Captain Okuyama ordered that each commando must try to destroy at least three enemy aircraft, regardless of the risk to his own life. The hours spent making dummy attacks on the mocked-up B-29 soon turned the unit into an efficient raiding unit, with each man sure of his job and the unit able to operate in the dark against its targets. This was demonstrated to invited senior officers on the night of 22 December, and the observers were mightily impressed. A mission was planned almost immediately on the basis of the demonstration, but the availability of aircraft to transport the commandos to their target was to cause a delay. The air squadron assigned to transport the commandos to their target was Captain Suwabe’s 3rd Independent Flying Unit that transferred onto the Mitsubishi Ki-21-II “Sally” bomber in readiness for the mission. The plan was deceptively simple. The Giretsu Airborne Unit would board a collection of Ki-21 bombers and fly south from Japan to the lonely volcanic island of Iwo Jima where they would be refueled. The planes would then fly on to the American-occupied Mariana Islands and crash-land on selected B-29 airfields. The commandos would then storm the parked B-29s and destroy as many aircraft and crewmen as possible before taking up positions close to the airfields to deny their use by the enemy with small arms fire. The attack was scheduled for 17 January 1945, and would be launched from Hamamatsu Airbase on Honshu Island. American air attacks on the airfields located on Iwo Jima intensified before the Giretsu attack was launched, as part of the softening up of Japanese defences before a full-scale invasion was launched. America wanted to use Iwo Jima as a kind of lifeboat anchored in the Pacific between the bases in the Marianas and Japan, so that damaged B-29s could divert and make emergency landings. The American bombardment of the Japanese airfields on Iwo Jima meant that refueling the Ki-21 medium bombers to be used by the Giretsu Unit was out of the question. On their own, the Ki-21s lacked the range to fly directly from Japan to the Marianas, so the operation was cancelled. US Marines captured the airfields on Iwo Jima in March 1945, and it was proposed to use the Giretsu Unit to effect their recapture, but the island’s garrison fell before the plan could be put into operation. The commandos waited in a state of readiness for another mission. They did not have long to wait. On 1 April, a massive American amphibious assault hit the big island of Okinawa, south of Kyushu. American forces captured the Japanese airfields at Yontan and Kadena on the island’s west coast, and fighter interceptors shot down many of the Japanese Kamikaze aircraft that launched massed attacks on American and British shipping supporting the invasion. Although the Kamikaze’s managed to sink several ships and damaged many others, American fighters flying from the two recently captured airbases seriously disrupted their effectiveness. Suddenly, the solution presented itself to the Japanese High Command on 15 May – use the Giretsu Airborne Unit to neutralize Okinawa’s airfields. Codenamed Operation Gi, the plan had a distinct advantage over the former operation against the Marianas. The Ki-21 medium bombers would be able to fly directly from Japan to Okinawa without requiring any refueling. The Giretsu Unit and the 3rd Independent Flying Unit were immediately moved south to Kengun Airfield on Kyushu. Preparations were hastily made for the assault on the two American bases. 3rd Flying Unit was equipped with sixteen Ki-21s, with a further four in reserve. All of the bombers were stripped of their guns to save on weight. Captain Okuyama with the Command Section and 1st, 2nd and 5th Platoons would fly in eight Ki-21s and assault Yontan Airfield. Captain Watabe with the 3rd and 4th Platoons would take four aircraft and attack Kadena. The Giretsu Unit would take off from Japan in the evening, timing their arrival at the American airfields just before midnight. Just before the commandos landed fifty army and navy Kamikazes would launch a mass attack on the airfields to provide a diversion, allowing the bombers to glide in and make wheels-up crash landings. The Japanese commandos would then storm from the bombers, using their pole and chain charges to cripple American aircraft and destroy vital facilities before taking up positions overlooking both bases where their small-arms fire would disrupt their effective operation. The following day, Operation Gi called for a mass Kamikaze attack by 180 Japanese aircraft on the enemy fleets off Okinawa, supported by thirty conventional attack aircraft including a few fitted with the Ohka jet-powered flying bomb (which was also a suicide weapon). All going well, the American fighter defences should have been severely damaged, and their remaining planes grounded by Giretsu commandos firing across the runways. Imperial General Headquarters in Tokyo believed that Operation Gi could have meant the defeat of the American invasion of Okinawa. It was a good plan, and although the American and British fleets had rapidly become accustomed to Kamikaze air attacks on their ships, no-one was expecting over 130 heavily-armed and well-trained Japanese commandos to suddenly appear behind the American lines, all of whom expected to die in the course of the mission. Captain Okuyama’s men were well armed and psychologically prepared for a bitter fight. They were armed with Arisaka Type 99 rifles, sub- and light-machine guns, grenade dischargers (what American soldiers erroneously called ‘knee mortars’) and the specialist explosive devices invented for the unit. Additionally, each commando also carried a Nambu Type 14 pistol and high explosive and white phosphorous grenades. X-day was set for 23 May, but bad weather over Okinawa led to the operation being postponed for twenty-four hours. On the evening of 24th a short and moving ceremony was held at the airfield at Kengun at the men raised cups of sake arranged on long wooden trestle tables on the airfield and shouted ‘Banzai!’ twice before taking a final sip. Captain Okuyama then gave the men a final rousing speech before the men boarded their aircraft and made ready for departure. At 6.50pm the first of the twelve bombers roared down the runway and took off, headed the 480 miles to Okinawa and what the men hoped would be a glorious death in battle. They were seen off by the ground crews who furiously waved Japanese flags as the bombers powered down the runway. Four of the bombers aborted the mission with engine trouble and returned to Kengun. The remaining eight flew on in formation before arriving over Okinawa. A radio message from the lead aircraft was picked up at Kengun, but nothing further was then heard from the Giretsu Unit as the planes began to make their descent into Yontan Airfield. The diversionary attacks had been launched by seven waves of conventional bombers that had started a large fire on the base, but not caused any significant damage. Marine Corps and US Army anti-aircraft gunners shot down eleven Japanese bombers. At 9.25, a Type 97 was observed approaching the airfield much lower than the conventional bombers and was immediately shot out of the sky. At 10.30pm three Ki-21 bombers appeared to be trying to land at Yontan, but their slow air speed, low altitude and regular course made them easy targets for the anti-aircraft batteries. These three all carried Giretsu commandos, and were among only four aircraft that actually got onto the airfield, the other four being shot down by American fighters. The pilots of the three damaged Japanese bombers attempted to use their aircraft as a giant Kamikaze’s, and with their commandos still aboard they slammed into the ground. 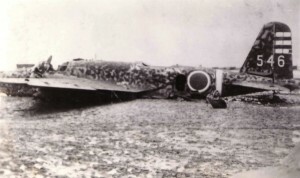 A number of the commandos actually survived the crashes and rushed out of the wreckage firing their weapons into parked aircraft and setting demolition charges. Only one of the Giretsu Unit’s aircraft actually landed as planned. It swung in low through a hail of flak and, wheels-up, safely skidded across the runway coming to rest only eighty yards from the control tower before ten commandos poured out from its nose cone and doors and began to attack American aircraft. As soon as it became clear that Japanese troops were on the ground, the American forces defending the airfield panicked and began firing literally in all directions. It has been surmised that some of the damage inflicted on the airfield’s facilities and aircraft, and some of the American casualties, were the result of this indiscriminate firing. All across the airfield both Americans and Japanese were discharging weapons, and planes and vital facilities were going up in smoke. At first light a Marine Corps unit was hastily dispatched to the airfield to hunt down and kill the remaining Giretsu commandos. The Japanese were all dead by 12.55pm, when the last one was shot whilst hiding in some brush on the base. Many of the Japanese airmen from the 3rd Independent Flying Unit, who had piloted the planes, had taken their own lives while the commandos had gone about their mission. Altogether, the Americans collected together sixty-nine dead Japanese from the wrecked planes or those strewn about the airfield. The Japanese commandos had managed to destroy four F4U Corsair fighters, and to damage a further twenty-two. They had also destroyed two four-engined PB4Y Privateer patrol bombers and four Dakota transport planes. Damaged aircraft included three F6F Hellcat fighters, two Privateers and a pair of Dakotas. The Giretsu commandos also set on fire a massive tank containing 70,000 gallons of precious aviation fuel. American losses were three killed and eighteen wounded. All of this destruction was largely caused by only ten Giretsu commandos from the one intact Ki-21 that had belly-flopped on Yontan’s runway, as well as a few dazed survivors from the crash-landing of another. If the entire commando of 136 men successfully landed the damage they would have caused, and the confusion they would have sown in the enemy’s ranks, does not bare thinking about. If the Giretsu Unit had parachuted onto the target rather than attempted the assault it by the dangerous method of crash-landing planes, more would have survived to continue with their mission. The mass Kamikaze attacks were launched against the Allied fleet on 25 and 27 May, the Japanese not knowing it the Giretsu Unit had successfully silenced at least one of the enemy’s airfields. Unfortunately for the Japanese, Yontan was fully operational again by the afternoon of the 25th and the Kamikazes were heavily defeated. The Giretsu commandos were undoubtedly brave and resourceful soldiers who died for a cause they believed in implicitly, but ultimately their sacrifice did not save Japan from inevitable defeat.